The Roll of Honor of the Imperial Tobacco Company is of special interest to me as my Great Uncle, Herbert (Bert) Shill, who was working there at the time he enlisted in World War I, is found on the list. He is shown to have been killed in action although he died in an accident. (click here to read eye-witness accounts of his motorcycle accident) . Image courtesy of: Library and Archives Canada, Amicus no.11256183, Canada's aid to the Allies and peace memorial/the Standard, The Standard, Montreal. 1919. Inside back cover, ecopy number e010900661-v8, edited. As Bert Shill's sister Nell said, "he worked in Imperial Tobacco before he went over and they were paying all the men while they were over there, putting it in the bank for them, you see." So the Imperial Tobacco Company supported the men who went overseas financially. This, in turn, could be a source of help for the families of those who went overseas. 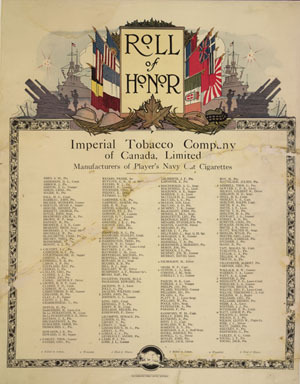 The Imperial Tobacco Company of Canada Limited's Honor Roll was printed on the inside back cover of the publication "Canada's Aid to the Allies and Peace Memorial." It is the only Honor Roll in the publication that appears in color. De La Durantaye W. Corpl. Millward C. Regt. Q.M. Sgt.